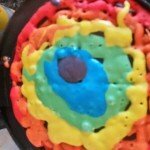 This rainbow waffle was a big hit with my daughter and niece. They loved helping to make it and they loved eating it even more. 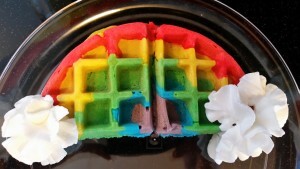 It’s a great breakfast treat for St. Patrick’s Day, Spring or birthday. My niece said she wanted to have this for breakfast at her sleep over party. 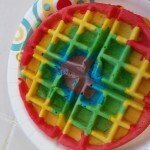 Follow the step-by-step directions below to make your very own rainbow waffle. Step 2: Place a food storage bag inside the tall cup. You will need one storage bag per color. Step 3: Place about 1/2 a cup of the mixture into the bag. Step 4: Add red gel food coloring to the mixture. Secure the bag with a twist tie. Mush the bag with your hand until the color is completely blended. I have my niece and daughter mix the colors, they loved it and it kept them busy. Repeat this step with each color: red, orange, yellow, green, blue, indigo and violet ( I only used one purple color). The back of the food coloring box with give you directions on how to make the colors. It doesn’t show you how to make the purple colors but red and blue make purple. Step 5: Place all the colors in a row in order of the colors of the rainbow: red, orange, yellow, green, blue, indigo and violet. Place them with the tips facing up. Snip off the very tip of the bag. 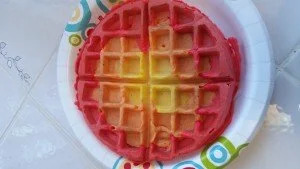 Step 6: Starting with red make a circle around the waffle iron, repeat this with each color. Step 7: Break the waffle in half and put on the plate. Squeeze some whipped cream on each side to represent clouds. Enjoy!